Literally an F1 car for the road. Exactly a year ago, Aston Martin revealed its Valkyrie hypercar, although it was then not much more than a body shell. Today, the UK carmaker has unveiled the nearly finished product, sporting an exterior design that's 95 percent complete. Along with many new photos, Aston Martin says the "teardrop-shaped cockpit’s upper body surfaces and lower tub contours follow the envelope of space available between the huge full length Venturi tunnels that run either side of the cockpit floor." Interior space is maximized by bolting the seats directly to the tub. The two occupants, in true F1 and Le Mans car fashion, are situated in a reclined "feet-up" position. Both passengers are meant to be at one with the car. Four-point harnesses are standard while six-point units will be made available for track enthusiast owners. To keep things simple for the driver, all of the switchgear is located on the steering wheel, and all vital signs are shown on a single OLED display screen. And yes, the steering wheel is detachable. Back to the exterior, the glasshouse design is specifically meant to ensure that forward and peripheral side-to-side vision is uninterrupted. 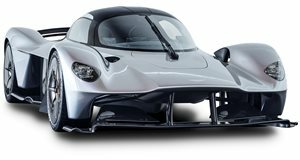 Because Aston Martin regards things like door handles as “unwanted aerodynamic disturbance… (or) clutter,” door mirrors have been swapped for rear facing cameras mounted on each side of the Valkyrie’s flanks. There’s also no rear window because of the all-enveloping bodywork and roof-mounted engine air intake. The overall exterior design remains mostly the same as the concept. Differences include some aero tweaks and the openings in the body surface between the cockpit and front wheel arches. There are also a number of interesting design details, such as the F1-inspired headlights that are 30-40 percent lighter than units available on other Aston Martins. The regular AM badge was deemed too heavy, so take note of the “wings” badge that adorns the nose. A plain old sticker wasn’t nearly good enough. This unique badge is amazingly 99.4 percent lighter than the regular enamel wings badge, and is 30 percent thinner than a human hair. At the rear, there’s a centrally located high mounted red LED stop light mounted on the tip of the small shark’s fin that runs down the car’s spine. Needless to say, the Aston Martin Valkyrie is quite something, and we can’t wait to see the 100 percent completed car when the production version debuts in the near future.